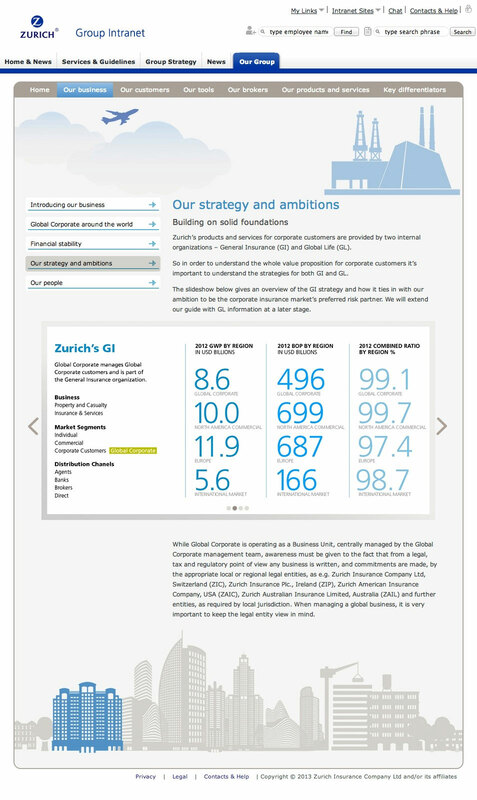 This ‘microsite’ consists of about 50 pages, but I’ve called it a microsite because it’s part of the Zurich Intranet. Unfortunately I’m not allowed to show you the actual site, so you’ll have to take my word for how amazing it is. This is REALLY great – kudos. Just a quick email to say it looks really great. It’s very useful to have all these information in one place. I can very well imagine the amount of work that’s lies behind it. It’s really impressive, clear, well structured with an attractive look and feel. Very well done! Great Stuff! Easy to navigate with clear and exciting information! A personal thanks from me to Simon, Becs, Martin, Jack and Miriam. We shouldered the task together and delivered something over and above their expectations. This job was very challenging – but well worth the effort. To be honest Jack, you are the key person in getting this project to be where it is and you have been brilliant to deal with, so a huge thank you from me too.